The 27.13 metre sailing yacht Sea Diamond, listed for sale by John Weller and A J MacDonald at IYC, has had a price reduction of $1,095,000. 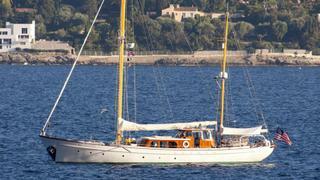 Built in steel by German yard Abeking and Rasmussen to a design by Philip Rhodes, Sea Diamond was delivered in 1956. Between 2001 and 2004 she underwent a major interior and systems refit at a cost of $6 million. Her entire interior was completely stripped down to the bare hull and a new interior was built from scratch. The end result was a masterpiece of woodwork in high gloss teak and holly woods. At the same time, the entire teak deck and sub-decking of this yacht for sale were replaced. Also during this refit period, complete new A/C and D/C electrical systems were installed, including all new pumps, air conditioning, and galley appliances. In 2009 new Sitka spruce masts and booms were built, along with new custom fabricated metal mast hardware. In 2010 the entire interior was redecorated with fresh fabrics and soft furnishings. Her upper saloon is home to a small dining table and leather seating, a desk and built-in television. Steps lead down to the main lower saloon which features a larger formal dining table to port, seating and a wet bar to starboard. Accommodation is for 6 guests in three cabins comprising an ensuite full beam master suite and a double and twin sharing a bathroom. Under power, two 165hp Detroit Diesel engines allow a range of 2,400 nautical miles at her cruising speed of 9 knots. Sea Diamond is now asking $2,900,000.